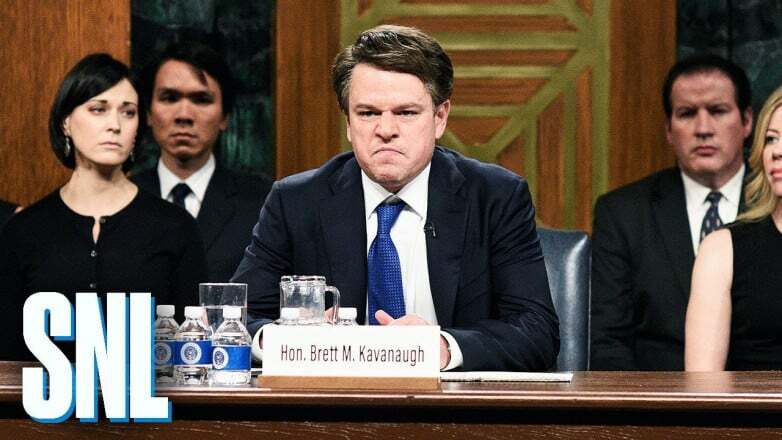 In its 44th season, Saturday Night Live frequently devoted its cold opens to lampoons tied to the political news of the day, from Matt Damon portraying Supreme Court justice Brett Kavanaugh to Ben Stiller’s turn as President Donald Trump’s former fixer Michael Cohen. The show has also seen a pro-Trump speech from Kanye West as well as Alec Baldwin’s continued impersonation of the 45th POTUS. Ratings for the new season have been consistent to a degree, with viewership tending to fall somewhere between 6 and 7 million per episode, but a new survey from The Hollywood Reporter shows many Americans are starting to see SNL as leaning too hard into political commentary. The poll shows 39 percent of respondents said the show had become “too political,” while 30 percent disagreed with the sentiment. There is some minor disparity among party lines. Most Democrats—about 60 percent—said they don’t think the show has gone too far politically, while most Republicans—52 percent—dislike the direction the show has taken in terms of political commentary. This matches up with how people perceive SNL politically. Almost half of respondents (48 percent) said the series leans left, while just 5 percent said it leans right. Only 10 percent of viewers found SNL to be neutral politically. Finally, when it comes to the content of the show itself, opinion begins to differ wildly. 55 percent of Republicans said the show incorporates too much politics in its sketches, while just 14 percent of Democrats say the same. This probably isn’t surprising given SNL‘s propensity to skewer right-leaning politicians and public figures, but it’s still worthwhile to see how Americans perceiving one of the major comedic institutions on TV.